Between our jobs and the boat projects we've been slaving away pretty much non-stop for three months. We've had a few weekends on the Bay when family or friends came to visit but we haven't taken any time for just ourselves. Over Memorial Day weekend we decided to take a few days and anchor out, get away from it all for a while. Saturday morning we managed to get away from the dock at a reasonable time, 0930, and motored out to red #2 in Herring Bay. The wind was blowing 8 to 12 knots out of the SSE so we rolled out the Main, Genoa and Staysail and headed off for Eastern Bay on a beam reach. Our boat really likes this kind of sailing and we ran across into Eastern Bay making an easy 6.5 to 7.5 knots (SOG). There were quite a few boats working their way up towards St. Michaels. As we passed a Beneteau 38 Cheri grabbed a few pictures of it. We contacted them by radio and asked for an e-mail address. They got the pictures right away and promised we would see some of LVD in a few days. The first two pictures here, above and to the left, are the ones they took of us. We cut inside the mark into the Miles River and ran close hauled as far as we could up to the Wye River entrance. We had a choice of tacking or dropping the sails and I chose to motor in the rest of the way. It's a long and winding path to our destination, taking about 45 minutes at 6 knots to meander back to our favorite cove located just beyond Pickering Creek. Seeing how crowded most of the anchorages were I was fully expecting to find our spot already overtaken. As we came around the final point and the cove came fully into view I was pleasantly surprised to find we were the only ones there. We anchored in 10' of water, far enough out from the shore to catch the breeze coming over the trees. This is a very secluded spot with no homes in site and all the visible shoreline is lined with trees. As I sat in the cockpit taking in the view a Bald Eagle dove down to the water not more than 40' off our stern. He skimmed the surface with his talons and rose into the air with a fish. I watched him fly off and land in one of the large trees on shore. This is what we came here for. A nice presentation of Mother Nature with a little slice of solitude on the side. We spent the rest of the afternoon futzing about. Cheri practiced her music for a while and I goofed off on deck. I got the dinghy out in case we wanted to row around or try our hand at fishing but we never got around to it. Why ruin a good thing by trying to do stuff? I spent a few hours in the cockpit catching up on my reading. Time well spent. Sunday morning we had blueberry pancakes in the cockpit. Memorable meal. After we finished up we debated how to spend the day. It was beautiful out, clear skies and a brisk wind, 20 knots out of the SW. We decided the best thing to do would be to get out on the Bay before the wind died away. As it turned out this wasn't really a concern. We were on our way by 1030. As we motored out the last leg of the Wye River into the Miles River we were running head on into the wind. I waited until just before we made our turn up towards Eastern Bay before unfurling the sails. We ran on a broad reach up to R4 and cut across the shallows off Tilghman Point. Running close hauled we raced down the bay but never had a real chance of making it past Kent Point without tacking. I knew that as we got closer to the entrance the wind would channel more from the south but we still needed another five or ten degrees. "Ready about..." We tacked down to R2A and then came about to run just clear of the shallows off Kent Point. A lot of people say that Island Packets are slow. I disagree. With more than about eight knots of wind they take off pretty well. What they don't do is point up into the wind very well. This is due to the design of the boat where compromises have been made to build a boat that's better in other respects. It's got a full length shallow keel which doesn't point up as well as a fin type, deep keel. Another thing is that the shrouds that hold up the mast from port and starboard are attached to the boat right at the toerail on the outer edge of the boat. 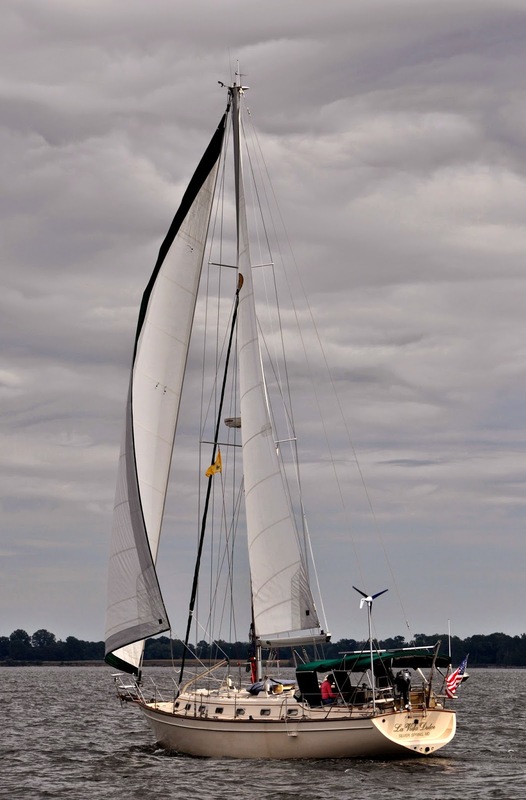 The Genoa sheets are led outside of the shrouds at the widest part of the boat preventing the sail from being drawn in any tighter, closer to center line. When we were sailing down Eastern Bay we were in a group of about five boats. The wind was blowing a steady 20 knots and I suspect that several of the boats weren't pointed up as well as they could simply to make the ride a little nicer. 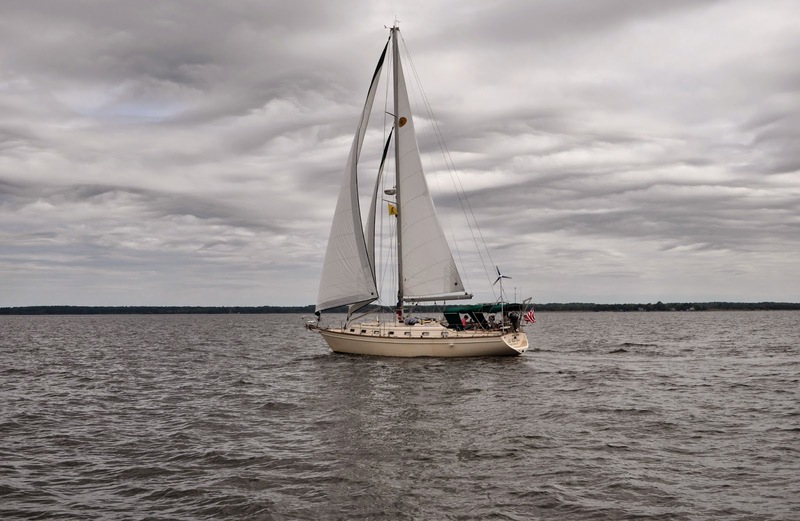 There were a few boats that could point up into the wind better than us though and I could see that they were going to make it out into the Chesapeake Bay without having to tack. Just a few more degrees would really make a difference at times like that. For figuring out how fast you can get between two points these are probably better values as they assume you can actually not spend too much time recovering. Running speed sustained is about twice that 8 MPH, 12 KmPH or 200 yards/meters per minute. I think I'll just stay in the cockpit and enjoy the ride. So, back to the story. Once we cleared Kent Point we had a straight run to Herring Bay on the western shore. We were running under full main and Genoa making about 7.5 knots. As got got clear of the influence of Poplar Island the wind swung a little more to the south and increased to as much as 25 knots. We were OK with this but the waves were really building up now because they had a clear run across the Bay. Something like 6 to 8 miles of clear water, completely unrestricted. With 20 to 25 knots of wind the waves will build up pretty well in that short of distance (imagine what happens out in the ocean with hundreds or even thousands of miles of unrestricted space. Yikes!) Rather than run with the rail in the water we reduced the Genoa to about 70% and the boat ran on nicely heeled over about 15 degrees. We had a pretty wild ride taking the wind and waves at 45 degrees off our bow. Lotsa spray in our faces with our feet propped up on the low side (leeward) cockpit seats. Bella has lived on board almost her entire life, all but three months, but she doesn't like it when things get rough (ruff?). She curls up in Cheri's lap and pretends to sleep. We crossed the Bay at a steady 7 to 7.8 knots and sailed right up to R2 in Herring Bay where we furled the sails and motored home. Sweet! This was just what the doctor ordered! Two full days of R+R to remind us why we're doing all this work. Ya gotta take that break now and then or you start to lose sight of the goal. I think it's an "optics" thing. This is the official countdown to our departure. The latest date we'll accept with little-to-no humiliation is March 31, 2015. That's exactly 200 days, 13 hours, 26 minutes and 34 seconds from now. Great post Tom, and it sounds like it was a great weekend. IPs aren't slow. Watkins 27s are slow! But who cares? If we wanted to go fast, we'd have gotten a power boat. Pointing under 40 degrees isn't the loadstone of a sailboat's performance either. As long as you can claw off a lee shore, you're doing fine. Both our boats are a little hampered sailing to weather, but they WILL go to weather, so everything's fine.